The Sunrise Moose Sconce features a majestic moose meandering alongside a mountain lake as the brilliant morning sun rises at dawn. Eye-catching Sunburst Opal art glass depicts the sky as Blue-Green Ripple art glass represents the water. 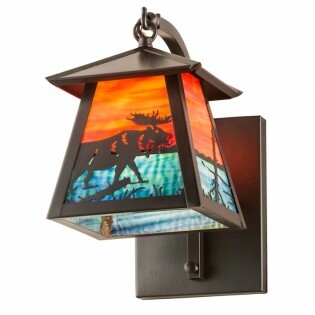 This sconce features decorative accents and hardware in a Craftsman Brown finish.